Home from the big adventure to Portland. I see why so many visit, fall in love and stay forever. Nourishment for the artistic heart pops up at every turn. Artfiberfest was equally so and I have photos to share from class later, but first, these off campus street snaps. Almost all ready to take off for Portland and Artfiberfest. Last Minute Lucy that I am, there are still a few things to do, some that will have to wait until I get back. Looking forward to meeting new and old art friends, teaching and learning- and certainly the opportunity to visit Portland! My brownies are The Best Brownies. My friend Cathy's are really good, but I have made enough brownies to know what I like best. Dark unsweetened chocolate (not cocoa) with walnuts and butter and real vanilla, baked to a rich, dense tile of thin (not puffy) chocolate heaven. The old Fannie Farmer recipe is the only one for me. The household technique here is to spray the brownie pan, line it with wax paper, spray again and fill. After baking and a 10 minute cooling on a rack, invert the pan onto a cookie sheet, peel the wax paper off, and turn right side up again onto a cutting board. Cut into bars. This way there isn't any digging into the pan to lift and remove so the brownies come out like those in a bakery with even sizes and edges. Store in a tin. Or freeze. * I have actually started to use the Earth Balance butter substitute. It truly tastes and bakes like butter, but is a lot healthier. We only use this product and olive oil now. (And no one asked me to say that. I'm a big fan.) In fact, I only shop at stores that carry it and it's a big bonus if the same store carries my favorite brand and flavor of yogurt too. Most days I try to visit Mom at lunchtime. I take fresh fruit to the table along with newspapers and other goodies from the outside world. After watching the permanent residents pass around our bowl of fresh pineapple in what looked like a scene from the Diary of Anne Frank, I realized that fresh food is a rare treat there. It's baffling to see what institutional kitchens cook and serve to folks who have dietary restrictions or are trying to heal. And I'm going to show up today with a big tray of brownies! (Yes, I do know that these aren't healthy, but at least they are fresh and homemade. And they taste GOOD!) I do love to bake. I'm bringing enough for the nurses and aides too. Without a doubt, they deserve way more than a few brownies. I don't know that I'll ever be able to properly thank each and every one of the kind, gentle souls who have helped my mother along toward recovery. Ripples of kindness begin today in a big pot of melted chocolate. The calendar is closing in on me with Artfiberfest next week. I'm excited to head west to Portland and looking forward to the event. In the meantime, I still have some work to do here to be ready to teach and learn. Thanks so much to Amanda at Soulemama for the link and mention of the decoupaged handbag on her Loving list. That was a nice surprise. I hope many of you give it a try ... it also makes a fantastic summer accessory for party dresses, especially those with twirly skirts. Last week I was invited to celebrate a girlfriend's big birthday. The hostess thought a gift card to the birthday girl's favorite store would be the best gift and we all pitched in toward that. That's a super small envelope so I offered to transform an old pocketbook into a bigger gift wrap presentation. So happy to have a crafty project on my to-do list, I was transported by the challenge and the art therapy. Find an old vinyl pocketbook at a tag sale or thrift shop. Look for one that has hard, smooth sides, a decent interior and a solid clip and handle. Clean it with a damp cloth. Paint the sides with a color you like. Acrylic paints are fine and streaky is okay. Try to avoid the metal accents, awkward spots and handles. Decoupage the front with whatever you choose- old wallpaper, copied photos, cut outs. Mod Podge or gel medium work well. Repeat for the back using a paper punch to pop out jumbo polka dots from old book pages. Punch from the margins so that contributors can sign the polka dots with their name, initial or note. Seal painted decoupaged areas with a last coat of Mod Podge or gel medium. Glue ribbon or trim across the top edges. Tie on a millinery spray and a gift tag. This would be a cute group gift for a graduation, a bridal shower or any situation where gift cards, cash or checks are involved. Pass the purse with a Sharpie, contribute, sign your name in one of the dots and hand it off. Nice keepsake too. The thrifting urge is apparently genetic. I got it from my mom, my girls got it from me. It's our idea of the best fun ever and generates that quirky style we call our own. In different ways and colors. Maggie's style always inspires me- especially when I see what she's done with my hand-me-downs. Maidenhair fern in my decoupaged cachepot project from Between Friends. A wedding gift we received in the 70's on a tag sale platter. Her favorite textile with rick rack hem thrifted in college. Tarnished, dented Goodwill bar tray. See the little salt and pepper squirrels. Maggie's collages she made for James in the background reflection. The famous lamp from Portchester and bar cart thrifted in Roslindale, MA. Her high school notebook doodle sketch. I could curl up here for an afternoon- or a week. Everything is just right. Saturday was the day that the boats sailed up the Hudson in celebration of Henry Hudson's discovery 400 years ago. It was spectacular- a crisp summer afternoon and a stunning show of vessels and sails. We were guests onboard a friend's boat. Quite something to see. You can't help but wonder what the English and Dutch thought as they headed north so long ago- on the river that the Native Americans called the river that flows both ways. (It does- currents go in both directions simultaneously.) A replica of the Half Moon was there too, but was too far away to catch with the camera. This is our town from the water view. The building on the left was built by my husband, Andy. It's why we moved here and I am so proud of everything he has accomplished here in our village- most of all that. It was designed to fit the style of the other factory buildings on the site (which he renovated too), the former Lord and Burnham Company, the preeminent builders of greenhouses and conservatories. It's a green building with geothermal heating and cooling, one of the first in Westchester. Erin and John Paul will be married here this summer! Thank you so much for all the thoughts and well wishes. They stay with me throughout these long days. The ripples of kindness especially. When I'm rushing around managing Mom's day, I think about the many folks around her who have no one there. I've learned a lot about elder care these past many days which included moving Mom from the first facility to another. There is no such thing as a nursing spa and that kind of turned around and bit me. But kindness, energy, optimism and back rubs count. Scrabble and cards too. Mom is much, much better. So am I.
Maggie and James brought us a picnic the other night, shared at the end of a particularly stressful day. She gave me a card full of encouraging words and her handmade coupon for dinner out (and maybe a thrift shop stop). A perfect rescue. The quote on the front is a new favorite. The big story continues to be caring for my mom. After trying to do so at home, the enormity of the emotional and physical challenges was wearing both of us down and her condition seemed to be so diminished that I decided to take her to the ER. That began the next steps of hospital stay and testing to see what had happened to bring about so much drastic change. Sometimes getting all eyes focused at once, together, in unison, is a good idea. Today she heads for a rehab stint at what I'm calling the nursing spa. Hopefully, the physical therapy will help bring her back a little farther. I'm still struggling with the new reality, determined to shape it with as many questions, ideas, requests and bouquets of flowers that I can manage. The assistance of friends has been necessary and humbling and generous, pulling us through these few difficult weeks. All of this takes place, of course, in the midst of so much else. Erin's bridal shower was last weekend in Chicago- which I managed to get to after all. It was completely wonderful and refreshing to be with her, to see their happiness! And lots of stuff before that. If I look at images or calendar notes, it comes back, but otherwise it's pretty much a blurry mess. I am trying to stay creative, dragging my work basket along with me. Tucked inside the tote full of medical records and other things (always put her lipstick on! 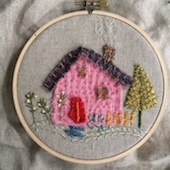 ), it offers a minute to stitch or sketch and that's somehow enough.